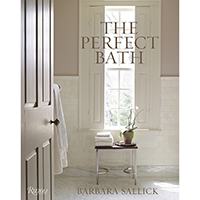 The Perfect Bath by Barbara Sallick is a chic, polished guide to creating your dream bathroom, including engaging interviews with top designers and practical advice for homeowners. Whether you call it your sanctuary, retreat, oasis, or spa, the bath is unlike any other room in the house. In The Perfect Bath, Barbara Sallick explores the process of designing a bathroom in great detail. Combining evocative, informative photography with an authoritative, engaging narrative, The Perfect Bath will be an essential, lasting resource.